I work with earthenware clay and I am concerned primarily with making utilitarian earthenware for table and kitchen use. The pieces are fired in an oxidation atmosphere to cone 03 (about 2000 F) in an electric kiln. I use the majolica technique in decorating my pots. 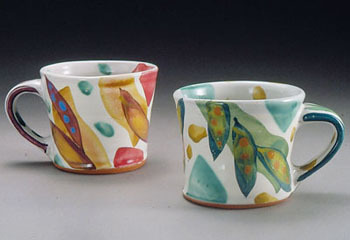 This is, simply, to paint with stains, oxides or colored glazes on an opaque light or white background glaze. Then the pieces are fired. 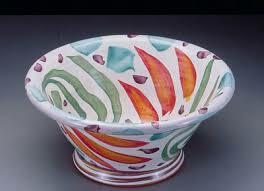 Historically, majolica-decorated pottery became popular during the 15th century in Italy. 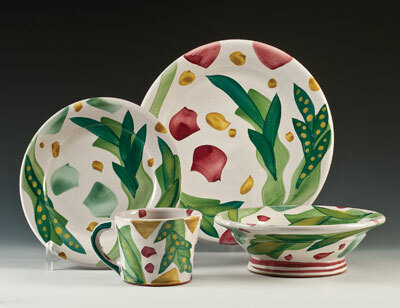 The name comes from the island Majorca where the Italians were first introduced to this type of pottery. This technique provides a wide range of bright, sharp colors. More importantly, I feel the majolica technique best allows me to convey the kind of attitude or feeling I want my pottery to evoke - that is one of lightheartedness. Most of my life was spent in the Midwest; I was raised on a farm in Iowa. After high school, I worked as a farm hand and on cross-country pipeline construction until I decided to go to college. I moved to New York after graduating from the University of Iowa and worked in the Columbia University Law Library. In 1971, My wife and I left New York and traveled around Europe. 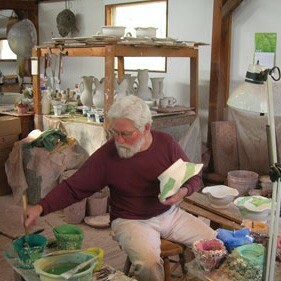 I began to work in clay when I returned to the University of Iowa which led me to enroll as a graduate student at the Rhode Island School of Design.